As the founder and majority shareholder of FINCA Impact Finance—a global network of 20 community-based microfinance institutions and banks—FINCA International is enabling access to responsible and innovative financial services for low-income clients. 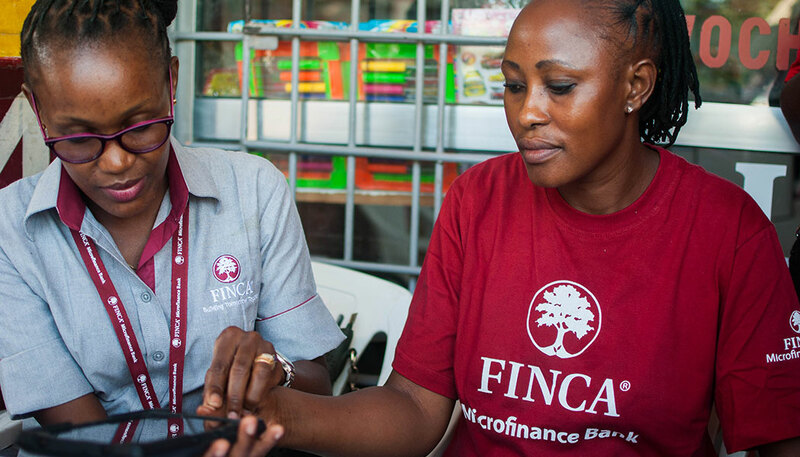 To reach more people, drive greater efficiency and reduce costs, the FINCA Impact Finance network is using financial technology (“fintech”) innovations to transform finance in underserved markets around the world. While the availability of financial services remains low in developing countries, mobile phone penetration is on the rise. Mobile credit, savings, payment and e-wallet solutions help the poor access financial services, save time and make secure transactions anytime and anywhere. 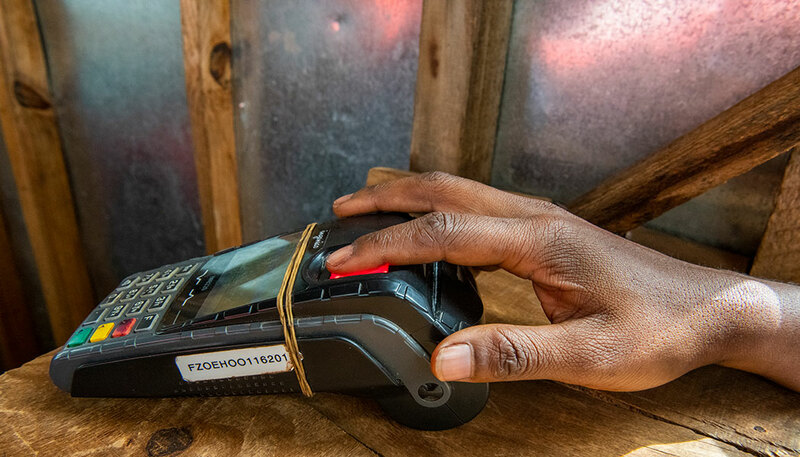 From a savings product in Tanzania to a free-to-use digital payments product in Pakistan, mobile banking innovations are paving new pathways to financial inclusion. In 2018, mobile banking accounted for 13 percent of all transactions across the FINCA Impact Finance network. 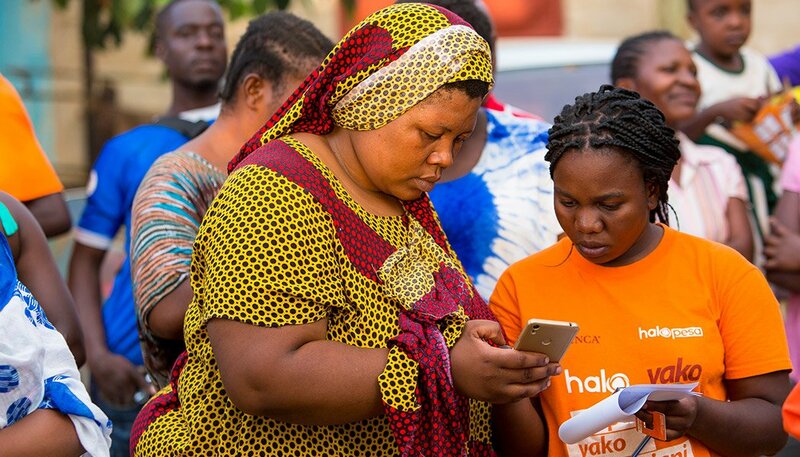 A female client in Tanzania opening a HaloYako mobile savings account. In areas without a physical branch presence, banking agents help to extend the reach of responsible financial services. A banking agent is a local merchant contracted to process clients’ financial transactions. An agent could be the owner of the local hardware store, grocery stand or corner shop. Each agent is equipped with a point-of-sale (POS) terminal that connects to the subsidiary banking network and client accounts. When a client visits a banking agent, he or she may pay bills, make deposits, withdraw or transfer funds, view account balances or conduct other transactions. FINCA’s agency banking began in DR Congo in 2012. By the end of 2018, FINCA DR Congo had a network of more than 1,000 agents that process over 80 percent of its clients’ financial transactions. Also in Africa, a partnership between FINCA Zambia, Comic Relief and Jersey Overseas Aid is set to transform agency banking to reach the rural poor. Banking agents processed nearly 30 percent of FINCA clients’ transactions in 2018. Banking agents utilize POS terminals equipped with biometric recognition, or fingerprint scans. This technology allows clients to access their FINCA accounts safely and securely, giving them security and control over their finances without worry about identity theft. POS terminal with biometric scanning used by banking agents in FINCA Zambia. For the 1.7 billion unbanked adults around the world, the lack of formal borrowing history hinders their ability to access capital to grow small businesses. Alternative credit scoring methods are being tested in places like Guatemala, which may leverage psychometric or mobile data to accurately assess individuals’ credit worthiness with the goal of expanding financial inclusion. FINCA Tanzania is one of several subsidiaries to pilot alternative approaches to credit scoring. Credit officers are equipped with tablets to digitally receive and transmit client loan applications, allowing for faster, cleaner and more reliable data collection. Cloud technology helps to automate credit scoring and loan application processes. Credit officer engages with a client using a tablet in FINCA Guatemala.